At this month's 4th Sunday installment of the Native Plant Workshop, to which all are welcome, we’ll discuss two new initiatives. One is to collect seed of native species this fall, for growing seedlings next spring. The other is to organize and train volunteers to inventory plant life in Princeton’s parks and preserves, for inclusion in an Environmental Resource Inventory being prepared this year. 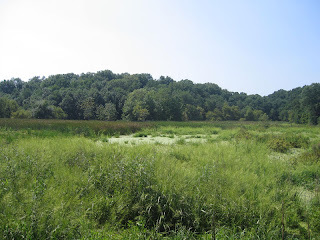 Following the discussion, we’ll head to Rogers Refuge (photo), a birding mecca below the Institute Woods, where an “accidental” man-made marsh hosts 100 species of plants. This time of year, redwinged blackbirds are gobbling down wild rice, and blooms can still be seen of pickerelweed and tickseed sunflower. No boots necessary, since we'll stick to gravel roads and the observation tower. Meet at the Whole Earth Center in Princeton, at 360 Nassau Street. The workshops are sponsored by Friends of Princeton Open Space and the Whole Earth Center. 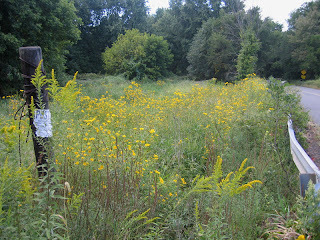 Take a drive out towards Route 1 on Quaker Road and you'll find the roadside near the canal filled with bright yellow. Though goldenrod plays a part, the chief protagonist is tickseed sunflower. 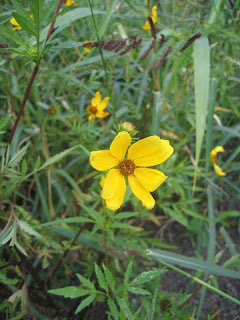 Unlike the many species of native perennial sunflower, this one's an annual, in the genus Bidens. Bidens was one of the showiest wildflowers along bike trails when I lived in Durham, NC, and though I'd lived here in Princeton for four years, I had yet to see it growing here in abundance until I turned the corner on Quaker Bridge Road and saw it stretching out across a broad field. This photo was taken a few days past full bloom, but halfway out into the field was a bright yellow world teaming with monarch butterflies bouncing from sunflower to sunflower. The butterflies are by now making the long journey to a hilltop in Mexico for the winter, and the Bidens are making seeds for next year's Really Big Show. There's a bench at Turning Basin Park in Princeton, located strategically on a bluff overlooking the canal. Nice view, except that the canal could not be seen due to a wall of Tree of Heaven sprouts that had grown up in front of the bench. This past Friday, the view of the canal was restored, thanks to a workday organized by Princeton WaterWatch and Butler College. 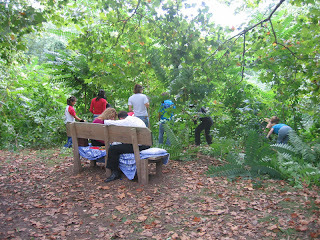 While a couple picnicked on the bench, 25 Princeton University freshmen came down to the canal and cleared the Tree of Heaven (Ailanthus) from the slope between Turning Basin Park and the canal. I gave them an introductory spiel about the role of Friends of Princeton Open Space in town and the value of doing habitat restoration. Though most had arrived with little knowledge of plants, they soon found themselves vigorously taking on Princeton's most invasive tree. 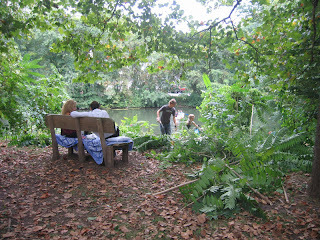 While clearing the view for the one bench, they found another that had disappeared completely beneath the swarming invasive growth (on the left in the photo). A highly invasive vine, Porcelain Berry, was also cut along the slope. Any resprouts next year should be considerably weaker, since cutting them this time of year will cheat their roots of any nutrients the leaves and stems would have sent down in preparation for winter. The view of the canal restored (the couple were comically oblivious to our efforts), the students then treated themselves to canoe rides. All in all a fun and rewarding afternoon. Mountain Lakes, part of 400 acres of preserved land between 206 and the Great Road, is a popular hiking spot for Princetonians. Home base of the Friends of Princeton Open Space, its habitat is in great need of ecological restoration. On September 7, 100 Princeton Day School freshmen and accompanying faculty arrived at Mountain Lakes for their second annual community workday. PDS has informally adopted the area in the upper right of the photo, stretching upstream along the two creeks that feed the lakes. 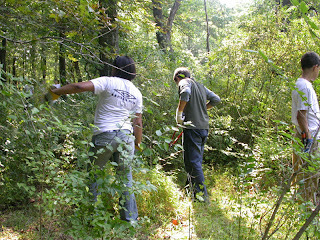 Using loppers, the students broke up into workgroups and took on the thorny multiflora rose that has displaced native species from floodplains in Princeton, as it has all over the eastern U.S.
Two hours later, large piles of the cut invasive rose were amassed in the woods, and native species like blackhaw Viburnum, sassafras and spicebush suddenly had more room to grow. 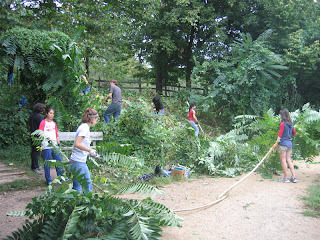 The students showed great perseverance and teamwork in achieving an impressive transformation of the landscape. 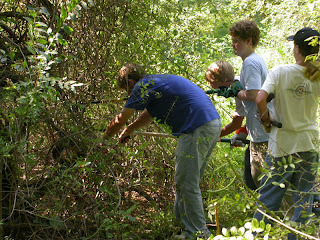 Here, two students push the thorny shrub's branches out of the way with garden rakes, allowing another student to reach in and cut the stems at the base with loppers. After lunch, the students returned to learn more about the ecological forces at work in the preserve. During the past couple Aprils, the ENACT environmental group from PDS, led by Liz Cutler, has also come to Mountain Lakes to help with invasive species control. Thanks to all the students for their hard work. And thanks to Mark Widmer for coming by to take photos. Stray into the woods behind Pettoranello Gardens, across 206 from the Community Park soccer fields, and you may wonder if you've happened upon ruins of an ancient civilization lost in the overgrowth. Strange towers rise out of the thickets, and improbably massive picnic tables lay half-sunken in the dirt. 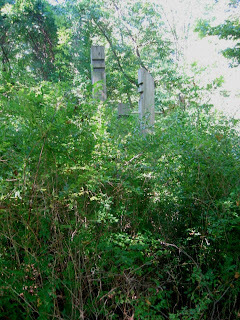 Markers reveal the identity of various trees, suggesting a nature trail once meandered through this forgotten landscape. Old rec dept. maps show that trails did in fact once traverse this area, but most disappeared beneath the invasion of exotic shrubs over the past couple decades. Multiflora rose silently covered this land in a Sleeping Beauty-like shroud of thorns. Then along came Harald Zurakowski, Princeton resident, seeking an eagle scout project. 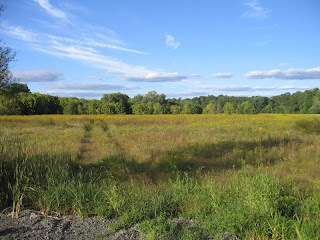 With help from the Friends of Princeton Open Space and the township, Harald planned his project, then mobilized family and friends over the Labor Day weekend to reblaze lost trails and make this place hospitable once again for hikers and native species. 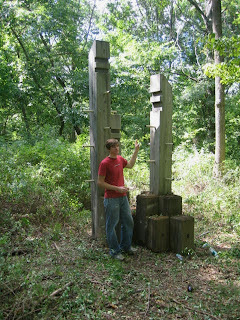 Harald poses in front of one of the Long-Buried Climbing Towers of Community Park North. 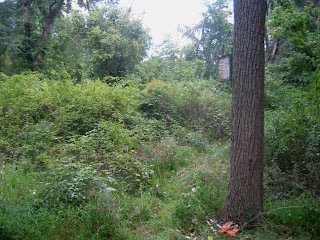 This is a "before" shot, showing the intimidating thicket of multiflora rose, privet and shrub honeysuckle that Harald and friends took on with nothing more than handtools and grit. 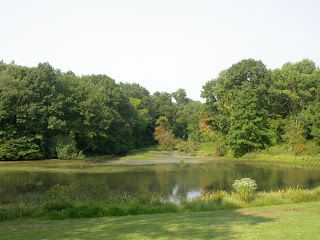 The goal was to create a viewscape in towards Pettoranello Pond from higher ground nearby. In the process, they created access to a rocky creek next to Pettoranello Gardens. 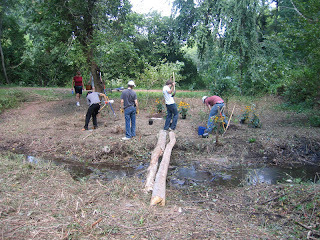 After the viewscape was successfully cleared, they planted native wildflowers and ferns provided by Mapleton Nurseries. 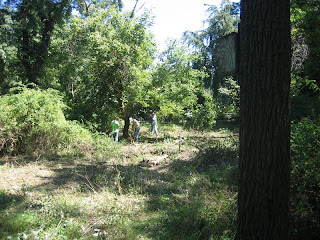 A few native shrubs--silky dogwood and spicebush--were spared during the clearing.